Last week our precious Morag's mum, Suzanne, died. I didn't know Suzanne, having only met her once, but Morag is absolutely one of the most special people in our lives, so our hearts were broken for her. I felt so helpless, being so far away. I wanted to hug her, I wanted to cry with her, I wanted to just hold her hand, if that's what she wanted. But I couldn't. So instead I started stitching. The day before Suzanne died, I'd come across an amazing collaborative crafting project called The Magic Feather Project, which aims to gather simple, appliqued stones from anyone who wants to spend some time stitching these simple, beautiful little gems. How beautiful, I thought, to craft something with hundreds of people from all over the world, to send something out to an unknown destination. It's kind of like having kids. You craft them, you grow them, and then, at some point, you send them out into the world, to do beautiful and wonderful things. The stitching I did to feed my need to 'do' something for Morag resulted in these 3 little stones, 2 of which will be sent out into the world, to join other stones and, hopefully, make someone, somewhere feel happy and warm. They were all stitched from a single, very old, hand-embroidered serviette, so the stones themselves are rich with patterns and textures, but almost invisible against their samey-white backgrounds. The 'Suzanne' stone will be framed for Morag to keep. The 'Morag' and 'Zeva' stones will become a part of a bigger project, my tiny gift to the world in honour of Suzanne's immense gift to us and others lucky enough to be touched by Morag and Zeva. I sit on the couch, computer in my lap, lemon drift tea by my side. My right arm is sore and doesn't quite work properly. Even typing is hard. Yes it is a tale of renderer's arm. While the second coat of external lime render has been started we decided to focus on the internal render today. The reality is we could move in without the external render complete but we certainly couldn't move in with the internal render incomplete. Without the internal rendering complete we can't make our earthen floor or get up into the loft to lay that floor (have we mentioned the amazing recycled hardwood floor timber we got for a really good price from a local demolition sale?) or do any of the other internal finishings. The second layer of render, the "brown layer" requires a slightly different recipe. Of course we're using Frank's recipe which is is 2.5 parts river sand to 1 part clay mixed with water to thick gravy consistency. Mixing the render by hand is a serious upper arm and abdominal workout. I try and imagine I am mixing a big cake - mix the dry ingredients, make a well and add the wet and mix, mix, mix...(Oh golly, it takes ages to mix it properly) Then pontificate for some time over what constitutes "thick gravy". The first batch was perfecto! Just like icing a cake. I have to admit I felt a little anxious about how rough our first layer was. I mean I knew it was meant to be rough but really, this rough? It was rough and dry and a little crumbly in places. I feared that we had been too near -enough-is-good-enough in our render creation and application. Of course we'd never rendered before so we needed to learn. Oh but still... All fears have been allayed by the ease of layer two. Yep just like icing a big beautiful cake. The second layer has been aided somewhat by the mesh that we have to lay simultaneously with the render. The mesh is used to further strengthen the render and to control cracking and will cover the entire house. It gets worked into layer two and seems to be providing a nice smooth base from which the third later will be applied. It was a big day. Annie is, at present, afflicted with tonsillitis so needed to rest in the almost-winter sun. The kids ran and jumped and explored and helped and I rendered for almost seven hours and now I'm tired, very tired. Despite the hours worked I didn't quite finish the Eastern wall. I almost made it but the light was fading and the kids were on the brink... So in one sense it doesn't seem like a lot, but still, it feels so very good. We're starting to get a sense of how beautiful our walls will be. A little wonky, yes but so warm and appealing and so very handmade. Olive and Oscar, running and running and running around our ever-so- huge 7x4 space. Just to prove, it's not so small after all. 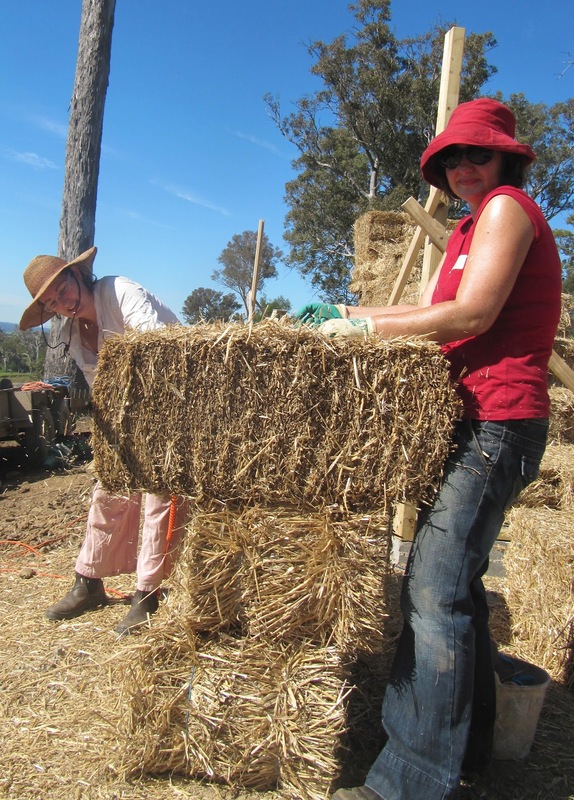 How funny to think that only 4 weeks ago we were coming to the end of our strawbale-building workshop, having spent almost a whole week wishing and hoping for the rain to stop falling. It's funny because now, we're thinking "bring on the rain!". We now have a driveway and a water tank and an almost-finished drain out the back of the little house and a sweet little duck dam just waiting for some water and some ducks. We're feeling ready. Ready-er than we have been since the bulldozer first made a cut on the grassy slope, only a couple of months ago. Exciting times! When we were building we'd lie in bed feeling anxious as the rain fell down but we knew that when our water tank was in place we'd be overjoyed to hear the rain. That day is now, and will be forever more, as we will soon be entirely reliant on the rain for our water. The water tank we chose was plastic. It was a huge decision for us, with months spent weighing up embodied energy, life expectancy, health issues, maintenance and that ever-present factor: cost. Having read Milkwood's characteristically thorough account of their very own deliberation, we knew that stainless steel was probably our ideal choice (though I was quite uneasy about the embodied energy). But the cost, aside from anything else, made them totally out of the question for us. Next up, plastic vs corrugated iron. We were leaning towards corrugated iron mostly because we like the look of it, and we were quite into the idea of having a tank that matched our roof. But they're quite a bit more expensive, and they're lined with plastic anyway, so the quality of our water wouldn't really be any different. They're also a bit trickier to install, and need a more engineered base, rather than just a sand pad, which is what the plastic tank sits on. Having a seriously limited budget, we were very concerned about not being able to finish the place at all, so were perhaps a little more swayed by cost than we would have liked. So we ended up getting plastic, with a view to getting a small stainless steel, for drinking water, if and when our budget allows. We also have a few very large glass water containers (some variety of flagon, perhaps? ), so may rig up some kind of water-catchment that runs directly into these, and we'll be getting a charcoal and ceramic water filter, for what it's worth. Our plastic tank came on the back of a truck, late in the day. It was much bigger than I had expected (3.7 metre diameter) and much bigger than the 3 metre sand pad our friend Brett and I had lovingly prepared. But the truck-driver happily helped us expand the pad, and within half an hour or so we were ready to unload. All 500kg of it. See the strawbale at the end of the truck? That's to stop the thing rolling right off the end and bulldozing our little house. It was kind of scary!! We rolled it to the end of the truck, spun it round a bit then just pushed it off the back of the truck onto the sand. Seemed kind of crazy/precarious/dangerous to me, but apparently that's the way it's done. It doesn't look so enormous now that it's in place, but there is definitely a sense that it's quite big compared to our little house. And yes, it is bigger than the tank recommended by the ATA's tankolator website, but we figured it was better to have too big than too small. I don't want no overflow coming out of that tank. We joked as the driver left us, that he'd be in the pub in Cooma that night exclaiming "Those bloody hippies in Bega - got a tank bigger than the bloody house!". Almost true. But we figure when (if?) we get our stainless steel tank, we can cut a door in it and it'll make a handy spare bedroom for guests. Cost of the tank was $1700 (delivered) for a 22 500 litre tank. I first started wondering if maybe we were in over our heads when I read Milkwood's blog post about their french door debacle. Hmmm... Was it really going to be so hard for us to do up our doors? Nah... With all the hubbub around the move to Bega and the starting the new job and the getting the land ready for building and the strawbale workshop, it was quite some time before I actually even looked closely at the windows and doors. They looked like they needed a bit of work, some re-glazing here and there, but nothing too dramatic. But then I started stripping the paint. And I realised, with no small feeling of alarm, that the dreaded lead paint was actually kind of holding the windows together, and that bits of them were kind of rotten. Then someone informed me that the windows needed frames. Oh dear. I'm not much of a restorer, or a woodworker having not done any variety of wood-craft since year 7, so this was all a bit daunting. But I'm always up for a challenge so dove right in. I'm not going to go into minute detail about the processes involved in this whole operation, but let's just say that, if I was charging myself some kind of reasonable hourly rate, these 'free' windows of ours would end up being pretty bloody expensive. 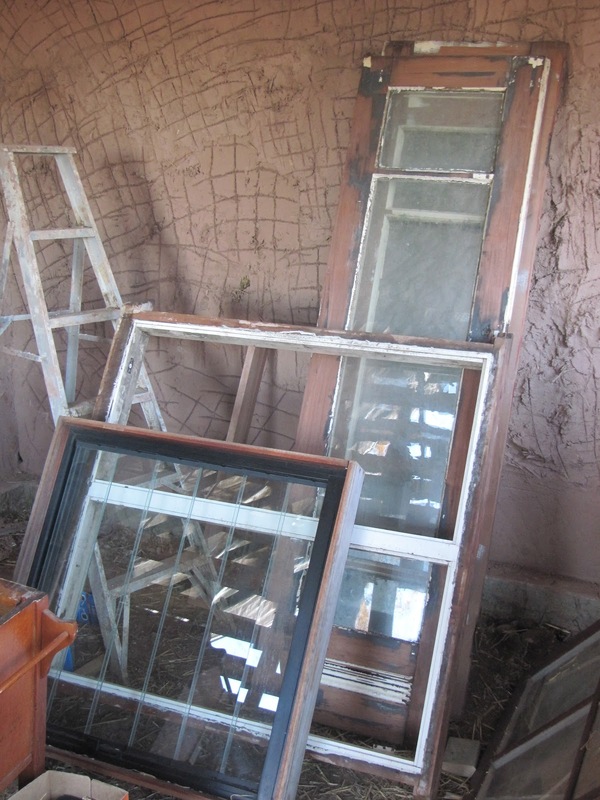 Here are the steps involved in restoring and installing your found-on-the-side-of-the-road frameless windows. 1. Start stripping the paint. I discovered quite late in the piece that, while a Bahco scraper is quite good, an electric plane is HEAPS better. If you suspect the paint is lead-based, wear a mask and clean up after yourself (ie. don't let your kids treat the paint-shavings like a sand pit). 2. Once the paint is off you'll be able to clearly see all the bits that need holding together/filling up with scraps of wood glued together with PVA and builder's bog and about a billion screws. Don't freak out, but get yourself some clamps: you're gonna need 'em. 3. Re-glaze by chipping out all the 100 year old putty that's cracked and falling out and replace with new linseed oil putty. 4. When you're satisfied the windows are no longer going to fall apart if you pick them up, measure them so you can make the window frames. Even if you've never done it before, by the time you finish you'll probably be alright at it. A good plan is to do the out-of-the-way windows (like the one in the non-loft end of the gables) first, so it's less easy for visitors to view your dodgy-brothers practice efforts. Make sure you have a sharp chisel, cuz you're gonna be chopping out a heap of wood. 5. 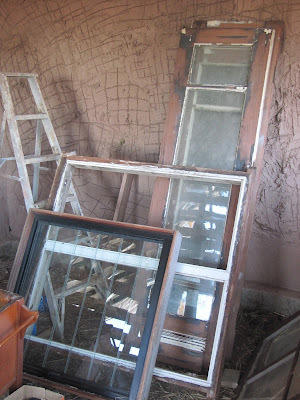 Install the window frames in the window bucks (the bits that make the holes in the strawbale walls), hoping that you did an OK job of measuring. If, like one of ours, you get a pretty tight fit on one of them, the electric plane and a little sledgehammer are going to be your best friend. And if like several of ours, the window buck is way too big, get some expanding foam. You can get non-toxic stuff that's made in Denmark (those Danes are sooo healthy). And make sure you read the instructions - it really does expand. A lot. 6. Chisel out the hinge rebates and fit the hinges. I used solid brass, because it's purdy, but probably wouldn't use brass again - it's soft, so all the holes need to be pre-drilled, which is just one extra step you don't need when you're installing windows by yourself. a louvre in the sleeping end of the loft for sea-breezes in summer and another at the other end of the loft for the sea-breezes to push all the hot air out of our sleeping spot. I'm glad they're all second hand. I would definitely use second-hand again, but I wouldn't just randomly pick them up off the side of the road without a very thorough check-over. And I'd make sure they already had nice, solid, hardwood frames that don't mind being 'persuaded' with a sledgehammer. Woodworking is just one kind of craft I'm probably never going to get into. Today a collection of "big noisy cars" came and dug around on our land. The main objective was the delivery and streamrolling of a slightly embarrassing amount of gravel, obtained from 'the pit' at Bermagui. After the week of rain that coincided with our strawbale building workshop, we realised that our dreams of a dirt driveway were... well... unrealistic. 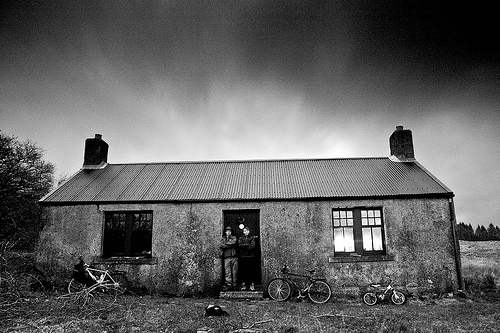 We have always been keen to try to limit the embodied energy of our little house-building exercise, and have done a reasonably good job of achieving that. And hey - very locally-sourced gravel isn't really huge on energy consumption, but it did come out of the ground and it is pretty much a non-renewable resource. So the decision to smother our super-slippery clay driveway in gravel was not taken lightly. But we did make the decision, and we did get the gravel, and we're going to live with our decision, knowing that it was basically the only way we could get our driveway to function as a driveway. Item number 2 on today's agenda was the digging out of a pad for our water tank, which is being delivered on monday. We're pretty excited. The reason the pad had to be dug, rather than just levelled, is that the inlet on our water tank is 2.3m high, and the end of our gutter is only 2.4m high and the tank needs a 10cm 'pad' to sit on. Do the maths (I know - it's hard...), and you'll realise that something needed adjusting. Cue Moonie and his little bobcat and the job's done in about 5 minutes. and a huge pile of clay which is going to be our earth floor (and probably our cob oven and a few other things as well). I LOVED watching our floor coming out of the ground not ten metres away from where it's going to be laid in our home. Nothing more lovely than a big pile of floor on a sunny Autumn day! And all our little visitors quite liked the action as well. We're having quite the love-in at the moment, after moving out of our rental house last week, and into the home of our quite lovely and special new friends Vickie, Max, Evan and Taylor, who have graciously offered us a space in their lives and their home for a few weeks between our last ever rental house (yay!) and our first ever hand-made by ourselves and our friends house (double yay!). Today they all joined us on the land to have a peek at the big machinery, bringing muffins and fruit and happy faces and testing out our clay by making sweet little flower-cups. All in all it was a pretty satisfactory half-day, which made us very appreciative of the fact that we don't really have to do a lot of digging by hand. I can't even imagine digging even a little duck dam in the clay with just a shovel, so I quite enjoyed watching Moonie and his mate scooting around in their bobcats and little steamrollers and bigger excavator/front-end-loader-type things, moving our earth around to make way for water-harvesting and duck-growing. In the midst of our building-in-the-rain stresses, little Olive made a trip to the library to escape the house full of wet and muddy workers, and to partake in some school-holiday activities. This video, made by our local ABC Open correspondent, captures some of what went on that day. Needless to say, when I saw Olive's stellar effort, I cried. 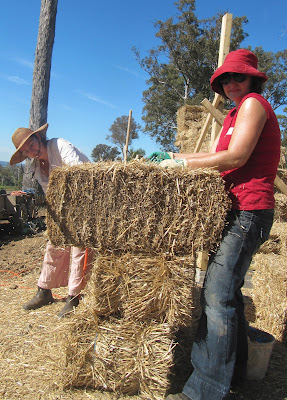 It's been so uplifting, even in times of all-our-strawbales-have-been-ruined-by-rain despair, to see how she's embraced the building journey with such joy and gusto, finding the fun (as only kids can) in the mud and the high tension. A couple of weeks ago, after hours of rendering late into the night (she was my special lantern-holder and mesh-cutter) she declared on the way home: "I reckon I'm pretty lucky. I bet no other kids in my class get to stay up late helping their mummas build a strawbale house, and then get an ice-cream on the way home." When most people see our house (or pictures of our house) they comment on its diminutive size - "are you 4 really going to fit in there?" - or its "fairytale proportions" - I reckon you should render it in lollies and call it a gingerbread house". So I was pretty refreshed when a work colleague of mine saw a picture of our little strawbs and said "Hey! That looks just like a Scottish Bothy!". "A Scottish Bothy??" I exclaimed, and so ensued a whole lot of oohing and ahhing as we perused lots of online photos of these outrageously cute little houses. It was one of those funny things: The day before the revelation of the bothies, Pearl's dad and I had been commenting on how our place kind of feels like you're in the mountains somewhere, especially when there's heaps of fog and/or rain rolling around obscuring the actually-quite-close-ness of Bega town. We talked a bit about Alpine chalets, but that wasn't quite right. 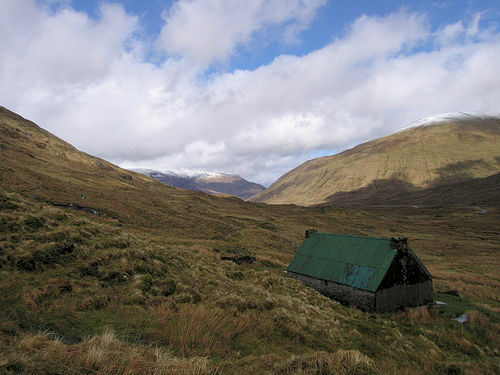 Bothies, on the other hand - perfect! Especially when I learned they are also drinking houses!! to McMansion-esque contemporary numbers like this. And if you look at our place... well... you'll get the DIY slightly wonky hippie Bothie cross. LOVE it. While all this diversity in the strawbale building world is cool, it's also kind of frustrating. So many crappily made, badly insulated, highly toxic UGLY houses are being built that are just going to perform terribly over the course of their life, sucking energy as their inhabitants try desperately to keep cool/warm through the seasons. 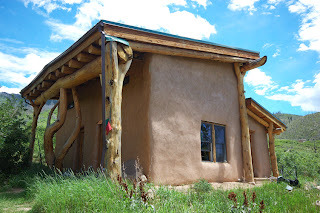 People could still be building the same shape and style of ugly houses (I dunno - people seem to like them...) but out of strawbale, and they'd probably cost the same, be better for the earth, healthier and much more comfortable to live in. Makes sense to me, but apparently not to too many other people. Humans man. What is up with their nonsensical ways??? First coat of render finished - happy permaculture day! Of course, I'd left the tricky bits til last. Frank, in his haste to get away, didn't give us any very clear instructions on how to get the render to stick to the underside of the window and door frames. You know those beautiful curved frames you see in strawbale books? Not so easy to come by. Luckily, we only had 4 windows and a door to do, and by the time I'd gotten to the final window, I was pretty good at it, developing my own loose-straw with clay-slip-suspended-in-a-mesh-hammock-attached-with-foil-clips method. Render seemed reasonably obliging and stuck to this contraption with only a small amount falling off. As always, I enjoyed every minute in our little house, and was especially excited to observe the passage of the sun over the morning hours, watching closely to see just how much solar gain we'd be getting this winter. I was pretty happy, as it crawled across the walls and floor for the whole time I was there. We're counting on this sun to heat up the walls and floor (our thermal mass) so that as the temperature drops in the afternoon, the heat is released into the house, keeping us warm in the night time. I was slightly apprehensive about how the house would perform in this respect, since the orientation was forced from solar north to more of a north-north-east aspect thanks to our friend the massive submerged boulder. But it seems like it's going to be OK. Yay! As if finishing the first coat and watching the sun crawl around our little house wasn't enough to make today awesome, it's also National Permaculture Day, and we were very lucky to be able to tour a few totally inspiring houses in our area. 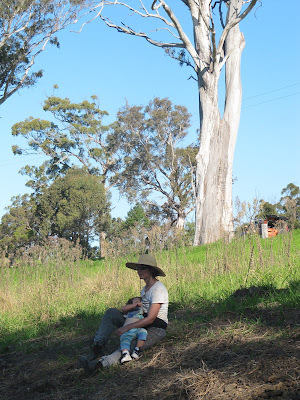 I felt invigorated and excited as I looked through these properties, picking and choosing the bits that could be applied to our place, learning about ducks and sheep, and feeling liberated by our friend Cam's approach to weeds in his food forest. Interestingly, I was actually calmed by seeing the 'big picture' that we're working towards, rather than just the 'to do' list that I've been struggling with since we started this crazy project. It was awesome to take a step back and visit people who, like us, started with just a couple of paddocks of weeds and grass, and built for themselves a home and a garden that are sustaining and fulfilling and brimming with joy and beauty. 2. we need to harvest more water off the road! this means planning a drain across the driveway to get that road-water into our diversion drain, which leads straight into the soon-to-be-built top dam. 3. cool-cupboards are cool! On the south side of the house, make a cool, shaded fernery-type garden. Then, make a big underground pipe that carries the cool fernery air into the bottom of a well-insulated cupboard (I'm thinking a dead fridge). At the top of the cupboard, have another pipe outletting the warm air. Convection currents will keep the air circulating and cool. 4. make the duck house in the middle of the dam, island-style, to keep them safe from foxes. 5. kikuyu doesn't actually need to be eradicated at all costs. I'd been expending quite a bit of energy stressing about all the weeds on our place, so was absolutely and joyfully liberated by Cam's approach, which he adapted from Jackie French - spend your time and energy planting, rather than pulling stuff out. If you focus on growing the plants you want, keeping them happy and healthy with things like mulch, worm juice, friends (as in a biodiverse food forest) and compost, they'll thrive, and eventually the weeds won't matter, and/or they'll be shaded out. And here's what I learnt yesterday: borage flowers look beautiful on an orange cake. You know how great you feel when you get a really awesome, handmade present? Well, multiply that by about a gazillion and you'll have some idea of how we're feeling every time we look at/think about our little house (which is pretty much all the time because we LOVE it). Yes, that's right, about a week ago, we got the best handmade present of all time when a bunch of our buddies got together to help build us a house. I know… AMAZING. To the people who shared with us in one of the biggest weeks of our life, THANK YOU for the generosity, compassion, support, cooking, skills, hugs, advice, fun times, tears, power tools, tarps, words of wisdom, endless iphone weather reports and most of all the LOVE you all brought to our new home. It may be a funny little gingerbread house, but guess what? We all made it! Together! With our own hands! How wonderful is that? Recently-arrived-bales action shot L-R: Little Steve, Nassim, Huon, Louisa, Cam, Tige, Sara, Alf, Deb, Big Steve, Peps, and the indefatigable Morag. Super-kid-wranglers, food-suppliers, hardware-purchasers, bale-stitchers, truss-attachers and awesome moral-supporters - Nanny and Jaije. Financing by Alfie, Oma and Opa and Gerlinde and Steve. Special thanks also for the many many words of love and support and encouragement, the good vibes and the site-visits. Actual cost of all this help and love and support? Absolutely priceless.